If you follow our blog or have seen our website you might already know that Mobile Jazz is somewhat different in terms of how our team works. One of the foundations of the company is “Optimizing for Happiness”. You also might have already seen some of this with our “Working Remotely From A Tropical Island in Thailand” blog post, where we explained how the team travels around the world and yet keeps the work up. Read about our latest company retreat in Cape Town. 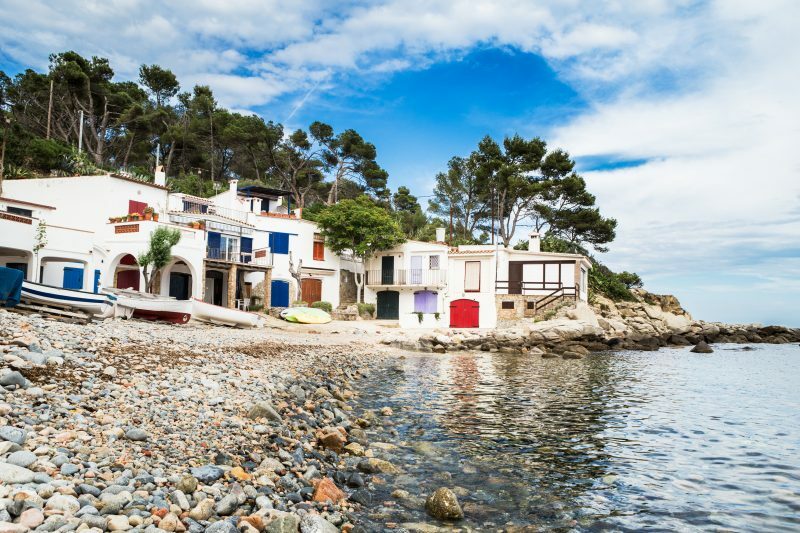 Landscape of S’Alguer beach in Costa Brava. Palamós. Today we’re going to highlight our tools in the cloud, an essential part of what makes Mobile Jazz possible as it is. Not all of our team members travel around the world as in the Thailand trip, but certainly most of us enjoy working from home every now and then, spending less time commuting and having a little more time for our personal lives. Be it family, friends, sports or, why not, just lying on the sofa (that’s also fun sometimes, right?). This post for example is being written from the sunny beach of Palamós, some 100 kilometers away from Barcelona, and business is still doing great. Even if Mobile Jazz is a software consultancy company and Bugfender is a software product for developers and testers, we’re not going to cover domain-specific tools here, so you can apply them to most businesses. This is the cornerstone of communication in our company. Actually Google Apps is a comprehensive set of tools which are probably worth mentioning individually. We don’t use all of them, so you’ll find here only the ones we actually use. This is the main channel of communication with our clients. It’s just an awesome mail hosting service with a web client that you probably know. Instead of the generic @gmail.com e-mail address with Google Apps for Business you can configure your own domain, such as @mobilejazz.com or @bugfender.com, without needing to go through the technical burden of setting up a mail server, anti-spam and such. In order to make email communication easier we have set up mailing lists with Google Groups so that it’s simple to address a specific group of people, be it by topic, department, project or the whole company. Google Groups also provides archives, so for example a person who joins an existing team can get up to speed quickly on the latest conversations in a project. By avoiding the use of the typical “office suites” such as Microsoft Office or Apple iWork we have the whole team in sync in a single place, at the same time that we save a ton of money in licenses. It’s cool that Drive even supports file format conversion, which lets you open files that clients send you without the need for such tools. We use Drive for lots of things: contracts, meeting minutes, accounting, drafting blog posts, shopping lists and even organizing our BBQs on the terrace! Besides the office suite functionality, Drive also allows you to store and share any kind of file, which is very useful no matter what software you’re using in the company. We often share folders with our customers, and that makes syncing with them a lot easier. Video conferencing is also an important tool to seamlessly communicate with your team and customers, no matter where you are. At Mobile Jazz and Bugfender we do general and topic specific meetings regularly. Video-conferencing adds this personal touch you need when talking to someone at a distance. We highly recommend setting up calls often even if you don’t need to. Some things just happen to stem out of informal or side conversations, and you would lose all this value if you stuck to e-mail only. Pro tip: It’s important to make sure wherever you go that you’ll have a good enough Internet connection that allows you to video-conference with some guarantees. A bad connection can spoil all the good energy and productivity needed in a meeting. If you don’t know if your connection is good enough, just make a brief call to a teammate and test prior to a real meeting. Skype even has this user “echo123” that you can call without needing anyone on the other side of the line. Phone is also obviously an alternative. Sometimes it’s less appealing but just works. Everyone knows how to use a phone and you don’t need a good Internet connection for that. If setting up a video call is getting too difficult be ready to resort to a phone call without much hesitance. Besides mail and video conferences you want a quick and easy way to reach your co-workers spontaneously. Hipchat is perfect for those cases where you would just walk to your co-worker’s desk and quickly discuss something. Also chat is less intrusive because if that other person is “in the zone” he might want to have you wait for a few minutes until it’s the right moment for them to respond. Your teammates will appreciate your respect for their time. I often find myself chatting to the person in the desk next to me. It sounds weird but sometimes is more effective. Set up a general room for everyone to make company-wide announcements. This will allow everyone to be in sync with the latest news: you just got a new customer, got something important done or are hiring a new team member? That’s a great place to share it. We often post news about the apps we’re releasing, new contracts we’re signing, discuss about company-wide decisions and share interesting blog posts. Set up a “coffee room” or “water cooler room”. Whatever you call it, inevitably people sometimes are in the mood for chatting or sharing funny kitten videos. You probably don’t want to get distracted with those when you’re concentrating, and that’s when having these discussions in a separate room that you can enter and leave is useful. Team status room. When you’re not working together in the same room it’s easy that other people don’t know what you’re doing. Writing it down in this room helps you get your day organized in the first place, but also lets other people understand what your day looks like and bring help if needed. This is also a great way to achieve a sense of collective accomplishment. Topic rooms. In our case we have “Android”, “iOS”, “web”, “design”, “marketing” and similar. These topic rooms are good for questions and answers, sharing topic-specific links and ideas only relevant to a few. Team rooms. You can make as many ad-hoc rooms as needed depending on how your business workflows are organized. You will want to have department and project specific rooms, some of them temporary, just mirroring how your organization’s offline conversations would take place. Anything that needs to be done in Mobile Jazz is written down in an Asana task. And when we say anything we mean ANYTHING! Actually, when you’re handling lots of things at the same time it’s very easy that something slips. With Asana you can write down what needs to be done, assign the right team member together with a due date, and make sure it will be done. You can eventually go back and see what’s left, and re-organize if needed, without fear of forgetting anything. Besides, Asana has great features for every team member to get their day organized, with the tasks they created or had assigned, and helps everyone keep an eye on deadlines. This tool would deserve its own blog post, you should probably check it out if you’d like to learn more. For us, Asana has mostly replaced Email for internal communication. Even if of our tasks are in Asana, some things are better displayed on a board. That’s where Trello comes in handy. You can support most business processes with Trello boards: keep your sales leads organized, mimic the software development scrum board, maintain your blog’s editorial calendar and tons of other things. Besides the obvious personal calendar, at Mobile Jazz we have several shared calendars, where we post when we go on holidays, if some special event or meeting occurs and things that can be of interest to the whole team. This works well for a company of about 20 people where we can keep the noise to an acceptable level. You might have trouble with shared calendars if you have a bigger team. All businesses have to make invoices, otherwise… it wouldn’t be business, right? At Mobile Jazz we use Harvest to keep track of time spent on every project and emit the invoices, both for time-based projects where we bill by the hour, and for closed-budget projects where we bill per feature. Harvest is especially helpful to service companies, where time tracking and invoicing are tightly coupled, and budget monitoring is highly valuable. Also another thing that all companies have to do is stay on top of due invoices in order to keep a healthy cash flow. Harvest will allow you to do that by keeping track of payments and even setting automated payment reminders for your customers. What’s important to realize is that communication is key to any company. Teams that work in a distributed way need to pay attention to this and provide the necessary channels to enable these communications that would naturally take place in an office. There are plenty of tools in the cloud that help you keep in sync with a team while you’re on the move. We shared most of our toolbox with you. What are your experiences with these tools? Do you use different ones? Please, let us know in the comments! Jordi has worked as a project manager, developer and security analyst in web, iOS and Android. He’s worked for companies big and the small in government, banking, insurance, healthcare and IT.